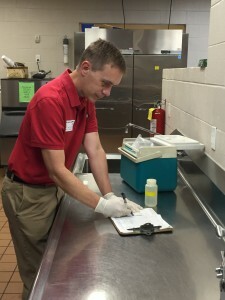 Early Lead In Water Testing results have revealed that more than 92 percent of DeKalb County Schools’ water sources tested to date meet federal standards. As of Oct. 14, approximately 260 water sources in 10 DeKalb County School District schools have been examined as part of the district’s Lead-In-Water Testing effort. More than 92 percent of those sources meet or exceed federal safety standards according to a preliminary report. Since testing began on Sept. 20, DCSD and partner Atlanta Environmental Management (AEM) have tested water dispensed from sinks, water fountains, ice machines and other individual sources at schools and facilities. In total at the campuses tested through Oct. 14, just 18 water sources exceeded federal safety standards. In each case the sink, water fountain or other source was turned off and efforts to make the necessary repairs were made. Once complete, water from those sources will be tested to ensure the quality is within federal standards. Testing will continue for the remaining campuses through summer 2017. To view the full testing schedule, visit the District’s Lead In Water Testing web page.